Editor’s Note: Mallard ducks are a very popular breed amongst backyard duck hobbyists, competing with breeds such as the Khaki Campbell for attention. It’s important to understand the basics of raising ducks before entering this fascinating and fun hobby! Others may be interested in learning how to care for wild Mallards. Interested in raising ducks at home? Mallard ducks are one of the most popular types of ducks amongst backyard hobbyists. If you are intent on raising Mallard ducks then you are best advised to start off with Mallard ducklings. Because Mallard ducks are known to be most social birds it is in the Mallards’ best interests if Mallard ducklings are raised in the company of other Mallard ducks and not alone. Mallards are also known to be naturally timid toward humans. In order to make your Mallard ducks feel at ease in your presence, you should invest quite some time to be around the Mallards you’re raising so the ducks get used to you. Though the Mallard ducks’ fear will never completely go away, the Mallards will gradually become used to you. The hobby of raising Mallard ducks is fun. Mallards will peck at you when they feel like having a treat and they will also follow you whenever they feel scared, particularly when moving Mallard ducks to new locations. Mallard ducklings that are acquired without their mother in tow should be housed in indoor cages or coops. The cages should be such that the Mallard ducks are spacious and include a nice pad of grass or another suitable padding material. An artificial heating source should be nearby. For the first week of their stay the heating needs to be slightly above room temperature. After the one week is over room temperature will be just fine. Look out for telltale signs regarding your heating source. If it’s too hot the Mallard ducklings will tend to stay away but if it’s cold they will huddle around the heat source. If you acquired Mallard ducklings with their mother you don’t need to raise them indoors because the mother Mallard will do the duckling brooding perfectly in the outdoors. It is a joy to raise baby ducks, but it also requires work. Your indoor-raised Mallard ducklings will be ready for the outdoors in four to five weeks and the baby Mallard ducks can start swimming since their feathers will be well oiled to insulate them and prevent drowning. Letting baby Mallard swim before this time may prove fatal. Five week old Mallard ducklings are ready for whatever weather; rain or shine. They should however be provided with a simple shelter to help them escape from the weather’s extremities. It is important that new Mallard ducklings you’re raising are provided with water but the volume should not be enough for them to wade or swim in. As for feeding ducks the duck food, ducklings will be most pleased with a diet involving freshly sourced vegetable greens. Common garden weeds will do the trick. 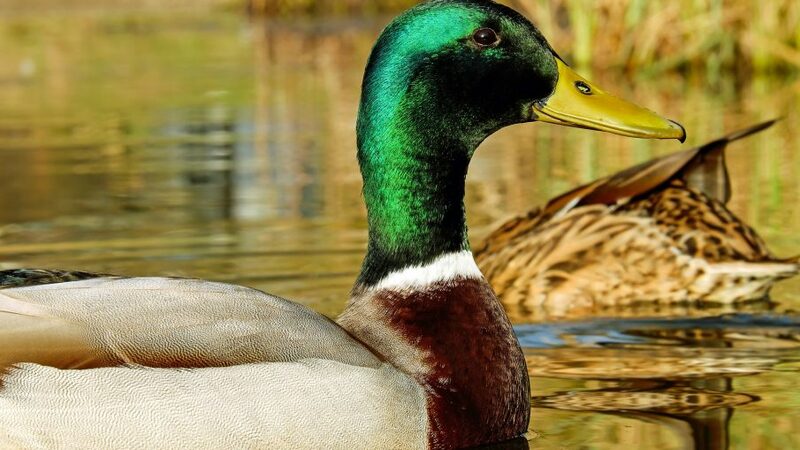 You should also feed Mallard ducks on game-bird starter feed. Do not feed them on ducks chick starter – this will most likely result in a condition known as Angel Wing. After five weeks, change your ducklings’ diet to game-bird grower, game-bird pellets and even cracked corn. When raising Mallard ducks in your backyard, they are also fed on grains like wheat and barley. Use a simple poultry feeder or a small bowl to feed Mallards and clean this bowl or feeder often. Provide water using a bowl or dish that is securely planted so as to avoid constant tipping by the ducklings. This bowl should also be cleaned as often as possible. This is quite simple. Find or purchase a nice incubator in which to place the egg(s). Eggs are available between April and August. Place these in the incubator with a set temperature of 99.5°F. Mist the eggs with a little warm water once daily. Hatching should occur after 23 days. Though Mallard ducks can survive without a pond they won’t be perfectly happy if this is not available – they simply love to swim. A natural pond is best but if your compound does not have one then you should invest in an artificial pond. A child’s wading pool is most suitable and this is quite cheap too. You will however be required to clean it out quite often as the ducks will tend to soil it every few days. Let the ducks forage, swim, and fly – don’t keep them caged all the time. As they play clean out their cages so that they won’t develop foot sores.